The small village of Arpora in Goa is minutes from the famous Calangute and Baga beach resorts. Arpora and its surrounding countryside has been a popular location for tourist development in recent years. Large hotels have sprung up in the fields behind Goa's golden coast, and a cluster of high quality restaurants cater for the annual influx of holiday makers, most of whom are on short package breaks. 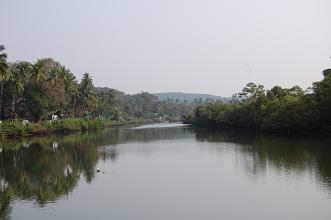 Arpora merges into Baga at Baga Creek, a small river that ends in the sea on Baga beach. Heading east towards Anjuna on the north side of the river takes you through Arpora, passing Mackies Saturday Night Bazaar which attracts tourists from all over the region. Despite recent development Arpora in Goa remains picturesque with traditional hamlets where you will see chickens pecking in the yards and goats tottering across the road. Rice fields, salt pans, palm trees and whitewashed churches are common features of the surrounding landscape. Arpora is a 20 minute walk or 5 minute taxi ride from Baga beach and Calangute, and most of the short stay visitors in Arpora's resort hotels head to these two popular beaches in close proximity. If these beaches are too crowded for you, consider adventuring north towards quieter beaches such as nearby Vagator beach (from where you will be ble to explore Chapora Fort) or northerly Ashvem and Mandrem. The Mackies Saturday Night Bazaar (more below) is a regular attraction in Arpora, and is a great place to pick up gifts and souvenirs. For a less tourist orientated market, try the lively Friday market in the nearby town of Mapusa. For tourists looking for a few weeks of uncomplicated relaxation, Arpora with its nearby beaches and plentiful hotels / restaurants offers all you really need. For those keen to explore, the area can be a good base from which to set out and experience what else Goa has to offer. Some people on package holidays have repoted hotel staff trying to dissuade them from leaving the hotel independently. This has far more to do with money than concerns about safety. With a bit of common sense, Goa is a very safe place to travel around. If you are staying in the resort hotels at Arpora in Goa, you will probably have airport drop off & pick up included in your package. If not, you can get a pre-paid taxi to Arpora from the airport. Travellers on a budget should get a bus (hourly) from Mapusa to Baga or Calangute and then continue by rickshaw or on foot (if alighting in Calangute a 5 minute bus journey will take you on to Baga). It is also feasible to go by bus to Anjuna from Mapusa (every 30 mins) and arrange a rickshaw from there. There are frequent buses running between Panjim and Baga / Calangute. If you are on a scooter or bike, it is worth knowing that one long road follows the coast (a little inland) from Siolim and the Chapora river bridge, to Fort Aguada, across the Mandovi river from Panjim. Once you are familiar with this road, navigation is fairly easy. Arpora is south of the turning towards Anjuna on this road. With Baga and Calangute nearby, and Arpora itself offering many fine restaurants, you will be spoilt for choice. Along the Baga river there are some excellent restaurants, such as the upmarket J&A's run by an entrepeunerial couple from Mumbai, set in an old fisherman's cottage and serving authentic Italian cuisine. Expect to pay around R.800 per head for 2/3 courses and drinks (about £11 / $17). Not to be missed, Lila Cafe by the Baga river is one of the best places to have a leisurely breakfast in Goa, serving huge, filled croissant, good coffee, fresh juices and yummy lassis. The interior is light and airy and customers can pick up local daily newspapers to read. View the menu on the Lila Cafe website. 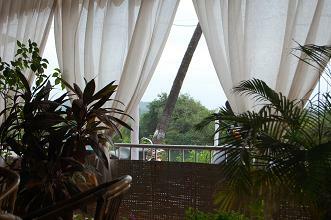 Hotels of Arpora in Goa are largely booked out ahead of time, especially the peak of the tourist season. Package holiday companies frequently utilise the larger hotels such as Abalone Resort, Resorte Marinha Dourada and Sun Village. The Riviera De Goa is one of the most luxurious on offer in the area. Along the Anjuna Road (on the north side of Baga river), several guesthouses offer rooms for moderate rates but usually need to be booked in advance. These include the inexpensive Melissa and the secluded Lina (on a small lane off the road). On a Saturday night in Arpora, tourists flock to Mackies Saturday Night Bazaar. The atmospheric setting by the riverside among the palm trees is further enhanced by strings of fairy lights and colourful lanterns. 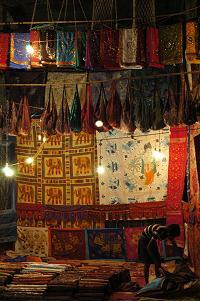 Stalls selling spices, souvenirs, sequined fabrics and insence, clothing, jewellery and more are tightly packed into rows around a stage where music and performances take place. Several food stalls offer worldwide cuisine. The market gets pretty busy, and sellers can be pushy to make a sale, so only talk about prices when you are seriously intending to buy, and always negotiate on the price to get a fair deal. Sadly closed in the 2010 season, Ingo's Saturday Night Market on the road between Anjuna and Baga offered a similar environment on a larger scale, but with a more relaxing vibe. If you are in north Goa for the 2010/2011 season, it is worth checking if this market has been resurrected. If you are staying in Arpora in Goa and want some ideas for excursions or have advice for other travellers, leave a message on our Blog!